Thank you to all my sponsors, Cervelo and their fantastic Soloist Carbon SLC-SL, very aero very comfortable and very stiff in a sprint, Niterider lighting systems,Kenda Tires for the C2C’s, Showers Pass for their Protech Jacket that I wore in the morning and again in the afternoon as the temperatures dropped, Nathan Sports for the reflective gear. Sportquest for their amazing CarboPro 1200 nutrition product, Red Star Energy for their quick pick me up energy tablets, and as always my club Team Velosport Team Sho-Air Sonace. 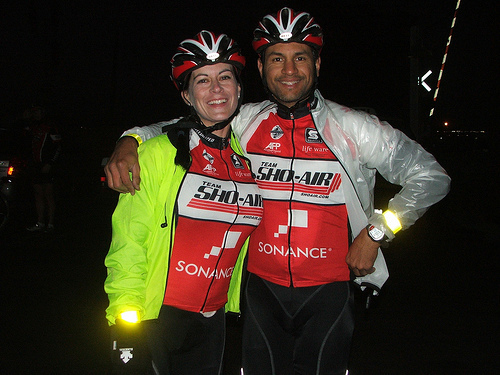 Saturday was the first double century of the California Triple Crown Series. I have done the right preparation for the limited time that I have to train. I felt good during the event. I came in with the third fastest time 10:46. I had good energy but lost the power in my legs around Mile 155. I had worked hard all day off the front with one or two other riders and paid I for it. 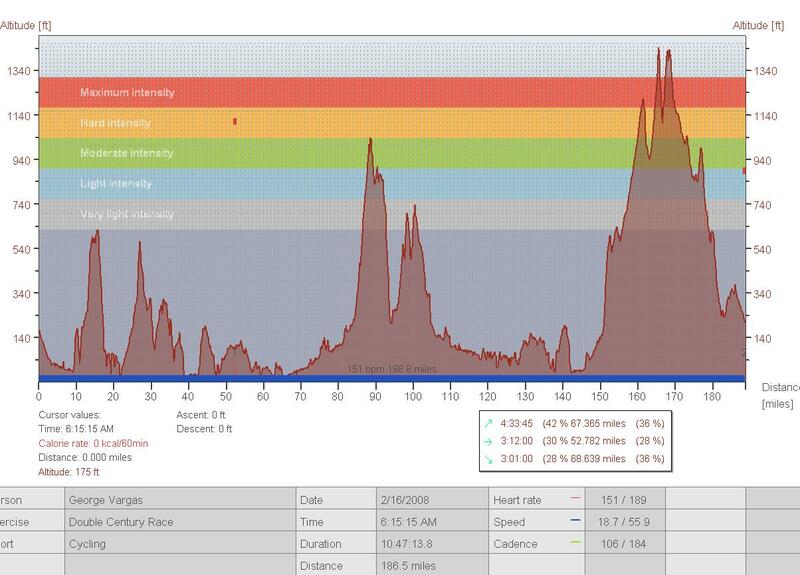 Additionally, I had done 260 miles of commuting during the week before the double century and that was also something I would pay for on the course. However, in the annual plan, this was just a training event with Everest Challenge and Furnace Creek 508 being goal events. 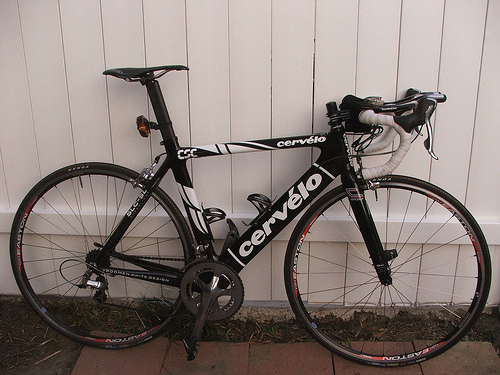 I rode the Cervelo Soloist SL–Sasha. I wanted to ride the SLC-SL because of the long miles that I would ride solo. I expected to be dropped by the lead pack so I also put clip-on aero bars. I used the Profile Design Sonic CSX because they are very low profile. 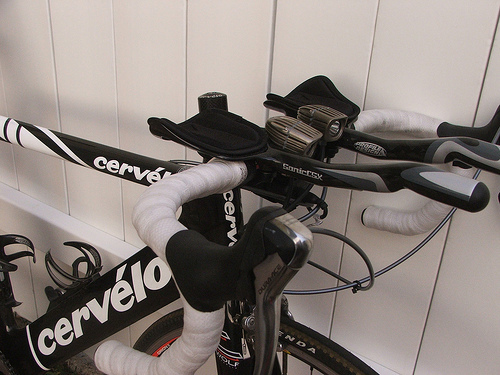 They rest right on top of the handlebars, they are light at 280 grams because of their full carbon construction. I ended up being the lead pack all day and used the aerobars when it was my turn to pull in the paceline and when I got dropped a couple of times and maintained my third place position during the last 50 miles. The NITERIDER MINEWT.X2 DUAL LIGHTING SYSTEM is a very lightweight system with a small battery pack and two very bright headlights. The benefit of the dual headlights is you can point them in different directions to make a broader beam pattern, or “stack” them to create a longer beam pattern i.e. one shining close to your front wheel and one overlapping but shining further ahead to allow more time to react to debris on the road. My only gripe with this light is that it appears to use the same battery pack as the MiNewt which is only one headlight hence the burn time is cut in half to 1:45 hours on High and 3:30 hours on low since you have to the draw of two headlights on the MiNewt.X2. ON THE OTHER HAND, you are getting twice the light as the MiNewt which is really nice when you are in rural sections of your double century. I would accept the weight penalty for longer burn times on the MiNewt.X2 Dual if the battery pack was bigger. Currently, the battery pack fits underneath a stem length of 90mm or longer. Very neat and clean installation!!! I strongly recommend the Niterider MiNewt.X2 Dual if you expect to finish within three hours of sunset in your double century efforts. If you need more burn time GET THE MINEWT IT IS LIGHTER, AND THE BURN TIME IS LONGER. The MiNewt is a fantastic light choice for commuting! The route was very urban, subsequently there were way too many traffic signals and stop signs as we meandered from Irvine (start) to the coast, “inland” and then back to the coast again. We started as a HUGE group and during the first stretch I took the time to coach Brandy on her pack riding skills. The traffic signals kept the pack together as we did the rollers. The ride finally started to move and pick up the pace as we got back on the coast at Crown Valley Pkwy and headed South through Dana Point and San Clemente. By the time we reached the San Onofre Campground we were down to seven riders in the lead pack. MILE 54.7 I was in and out of the first rest stop in two minutes or less. I went out on my own and got caught by David “Mudcat” Holt about 1.5 miles before getting off the I5 southbound freeway. About 1 mile from the off ramp a paceline of six riders caught me. MILE 66.2 We took the exit off the I5 freeway and Max tells me someone flatted behind us. I knew there were eight of us in the paceline and now it’s just the two of us, so I figured a few riders had stopped so Max and I rolled on. When I pulled into the lunch stop I find out that Keith Brodsky had crashed. After the event I found out he fractured his clavicle. I wish him a speedy recovery he is nice guy and fierce competitor. I’ll miss chasing him for the next 6 weeks. From the 5 Freeway to lunch it was just Max, another rider and I off the front. MILE 84.7 Max, another rider and I pulled into the lunch stop together but I didn’t stay long. I checked in, said thank you to Phil Thomas for volunteering, said hello to Jon S. and I was off in two minutes again. I knew Max was stronger than me. I thought if I took-off ahead of him he would chase me and hopefully each time he had to chase me it would wear him down. Remember, I left out of the first CP first and they had to chase and catch me for 12 miles. But Max didn’t stay too long and he was on my wheel half-way up the Circle R Rd. climb. We chatted for a little bit and then he said we needed to keep the tempo up otherwise the tandem would catch us on the second half of the course. And with that, Max accelerated his pace and I couldn’t keep up. I was dropped and he was gone. I WAS NOW RUNNING IN SECOND PLACE. MILE 100.4 I was alone for the next 15 miles and just as I was about to make the left turn on to Reche Rd off of the 395, I was caught by Dan and Phil. That is where I had my “defining moment”. Their pace was faster than mine and they were working together climbing a roller. I got dropped. I knew that the roller came down to the entrance of Live Oak Park (Fallbrook). If I didn’t get on their wheel now I could possibly lose them and going West on the Oceanside bike path would slow me down even more. I made a huge effort to catch them. They were about 100 meters away. I dug deep and was able to make contact just as I blew up. I recovered on the downhill and since they were larger riders I was able to recover and draft off of them until my turn came to pull. It was a gamble and it paid off because I was able to ride with them until mile 155.5. MILE 167.5 CP#4 Trabuco Oaks General Store I was caught by a pack of 7-10 riders. I was in and out in about 2 minutes again. Lee was there volunteering and I told him that I was hurting. It was 3:30pm. MILE 171.7 Right turn Santiago Canyon Rd. My right foot hurt so bad I had to take my shoe off and pedal with my foot on top of the pedal. I hadn’t had “hot foot” this bad since I was training for the 508 back in 2006 and I would go out on 150 training rides. I mean I was so close to pulling over but I didn’t want to get caught and so slow and steady I moved through Santiago Canyon. I pedalled like that for a good 5 miles and finally my foot felt better and I put my shoe back on. When I finished putting my shoe on I looked behind me and saw the tandem of Craig Robertson and Graham Pollack. I knew this was going to be a fast chase because we were on a slight downhill. I timed my acceleration just right and jumped on the tandem’s wheel. I stayed on the tandem for the last 10 miles in to the finish. On the way we picked up David “Mudcat” Holt. I WAS NOW RUNNING THIRD AGAIN. The positioned remained unchanged until the finish. 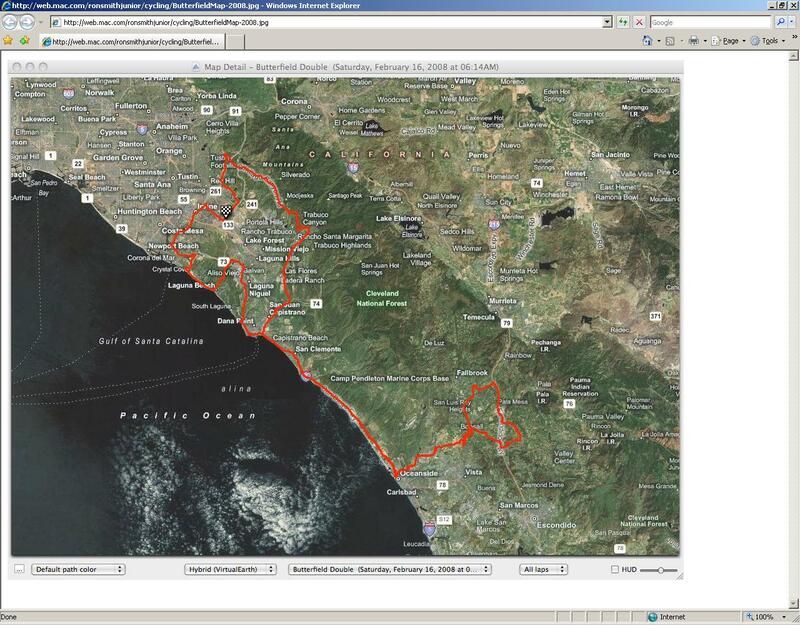 This entry was posted in Brandy, double centuries, events, race reports by REV Cycling Directeur Sportif. Bookmark the permalink.